Phu Tho (VNA) – In Vietnam, the janitor of a pagoda (or temple) is usually an elderly person respected by the local community, who is selected by the community to do the work for many years. But it is even harder to be selected for the job at many temples in the Hung Kings Temple historical site in the northern province of Phu Tho. Currently there are six temples in the Hung Kings Temple historical site, which are the Lac Long Quan Temple, the Au Co Temple, the Thuong Temple, the Trung Temple, the Ha Temple and the Gieng Temple. For the two newly-built temples - the Lac Long Quan and Au Co Temples, the relic site management board appoints janitors to look after them, but for the remaining four temples, which have been around for a long time, the local community attaches great importance to selecting the janitors. Besides the respect and trust of the local community, janitors at the four old temples in the historical site must pass an examination, and can hold the position for only one year and just once in their life. The examination to select temple janitors has been held annually for nearly two decades, with the aim of choosing persons with thorough understanding of the history and details of all relics in the relic site and rituals in worshiping the Hung Kings. According to Pham Quoc Khanh, deputy director of the Hung Kings Temple historical site, there are strict requirements for candidates for the position of janitor at temples in the site. Candidates, selected by local communities, must be men at over 60 years old, who have happy and law-abiding families. The candidates themselves should be ethical, have good health and nice appearance. In particular, they must have good understanding of the historical site and cultural and historical values of the worship of Hung Kings. 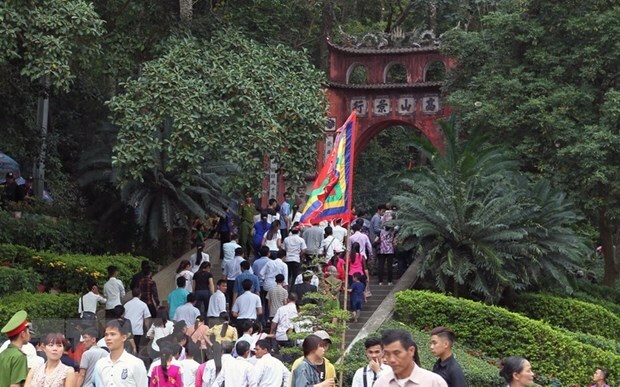 The examination of potential janitors is held in mid-December, testing the candidates on legal documents on the historical site, regulations on the preservation of the site, the history and architecture of each temple, and everything related to the worship of the Hung Kings. An important part of the exam is the practice of rituals at the temples. The one-year term of a janitor begins on January 1 and ends at December 31 the same year. This year, 64-year-old Dao Kim Muon from Ca Village, Hy Cuong commune, was chosen to be the janitor at Thuong Temple. “Being selected for the job is an honour for me and my family and my village as well,” Muon said. Every day, the janitors at temples in the Hung Kings Temple relic site begin their work at 6 am, cleaning the altars, replacing the offerings, burning incense and striking the bell. They start the day even earlier during the Hung King Temple festival. “Besides looking after the temples, we spend time learning history, reading stories and looking for related information in order to talk to visitors,” Muon said. He added that he also coordinates with other relic site workers to guide visitors in practicing the worshipping ritual, such as how to arrange the offerings and pay tribute, and at the same time advise them not to join in superstitious practices. The Hung Kings are the legendary founders of Vietnam. They are believed to rule the country for 18 generations. To honour the Hung Kings, a complex of temples dedicated to them was built on Nghia Linh Mountain, and the tenth day of the third lunar month serves as their anniversary.